Saturday, we started off the day with renting bikes. Walking is a great way to get around, but you cover more ground on a bike. 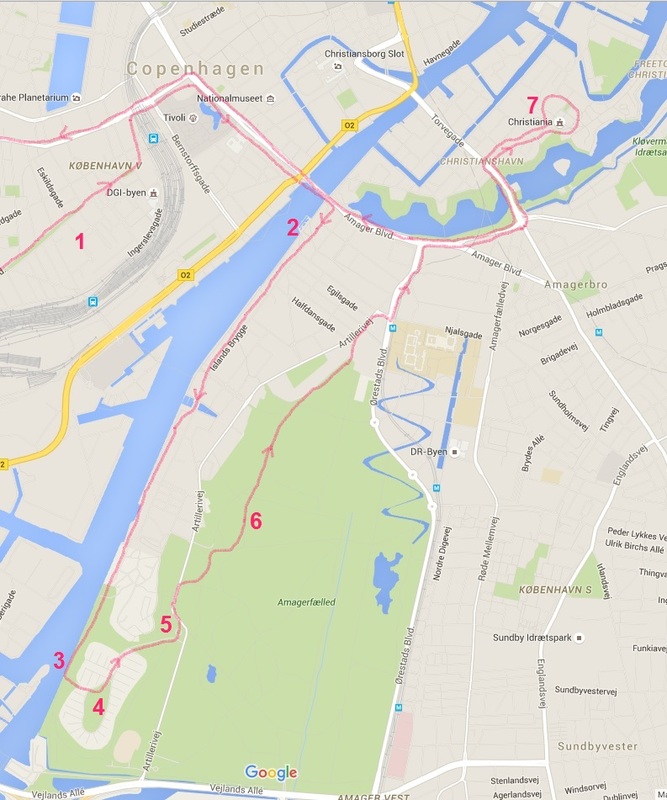 There are several places to rent bikes in Copenhagen, and if I could give any recommendations, it would be to rent a bike as soon as you get there. In hindsight we should have rented our bikes from day one. It’s cheap, and would have saved our feet Friday 😉 We found a rental place just a few streets down from where we lived. We left our apartment in the morning, got our rental bikes and took off for the day. As soon as we got the bikes we figured we needed a little food and we roamed the Meatpacking district (1) for a place to eat. The meatpacking district used to be, where Copenhagens meat industry had their businesses. Nowadays the area has turned into a more trendy restaurant and nightlife area. And it turned out we were too early and most places wasn’t opened up yet. Instead we found a small deli a few streets up, where we grabbed some food for a quick brunch, and snack for the road. Then we took of towards a couple of Copenhagen’s allotment gardens, on the island of Amager which is a large part of Copenhagen. We decided to bike to these allotment gardens because we wanted some green time, time away from all the hustle and bustle of the city, where we could have a picnic and just relax. As we biked further along the canal, we found Amager Common. Amager Common is a large green area with fishing ponds, trails and loads of birdlife, and we hit the park right alongside the canal. A few hundred meters into the park we saw this cute little quay (3) and decide to stop for a picnic and a bit of sun. On our way back towards the center of town, we biked along the bike trails within the Amager Common (6) and it was great. The birds were singing, we hardly saw a soul and if we hadn’t known better we could just as easy have been in the middle of the countryside miles from civilization…. It’s a beautiful area as you can see here! 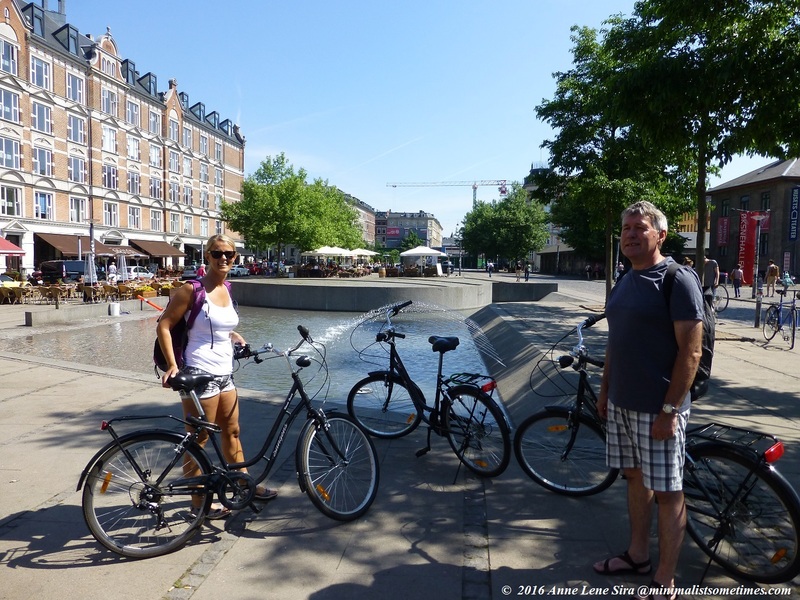 When we hit “town” again, we were just down the road from Christianshavn and the freetown of Christiania. 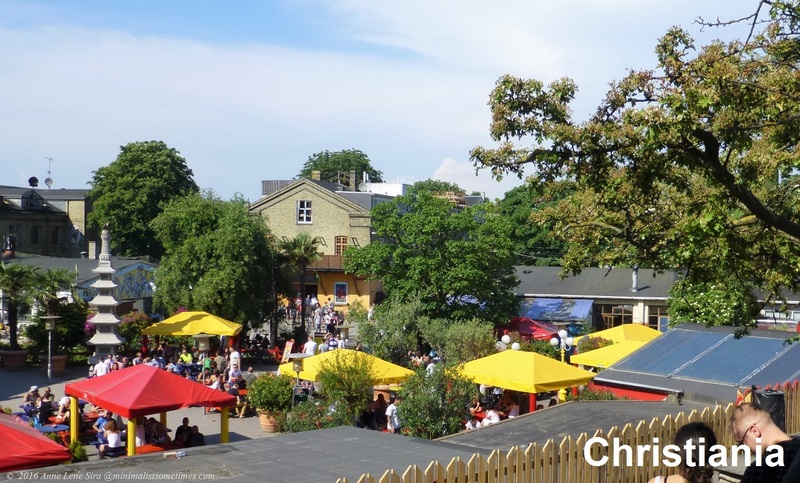 Christiania is Copenhagens fourth largest tourist attraction. Christiania has it’s own history, the idea behind Christiania is that is is a free, self run society, kind of a free state within the state. They have their own rules and regulations. The place is famous for its liberal views on cannabis and it is still possible to buy hash and various strain of weed on Pusher street. They are however fighting hard to keep harder drugs out of the area. The reason I wanted to visit the place is that the area around the lakes have all these little self built houses that are really cool (I’m a fan of tiny houses and other small dwellings). And within Christiania itself there are a bunch of quirky small houses. Since we had a dinner reservation at 18:30 and wanted to go home for a quick shower (I told you it was sunny and warm, right?) we only got to see parts of it all. But I will be back.. and maybe next time I’ll get to find some of the ones that are along the lakes, some you can see here. All in all it was a great bike trip around the city, including several stops on the way, some sunning and a picnic on the quayside, you can easily do this in a few hours… from the moment we started biking, to the moment we were back “home”, we had been out and about around 5-6 hours. I have to tell you about, where we went for dinner that night. I had first come accross an article about this restaurant a while back. It had gotten rave reviews as a place you could have gourmet food at affordable prices. 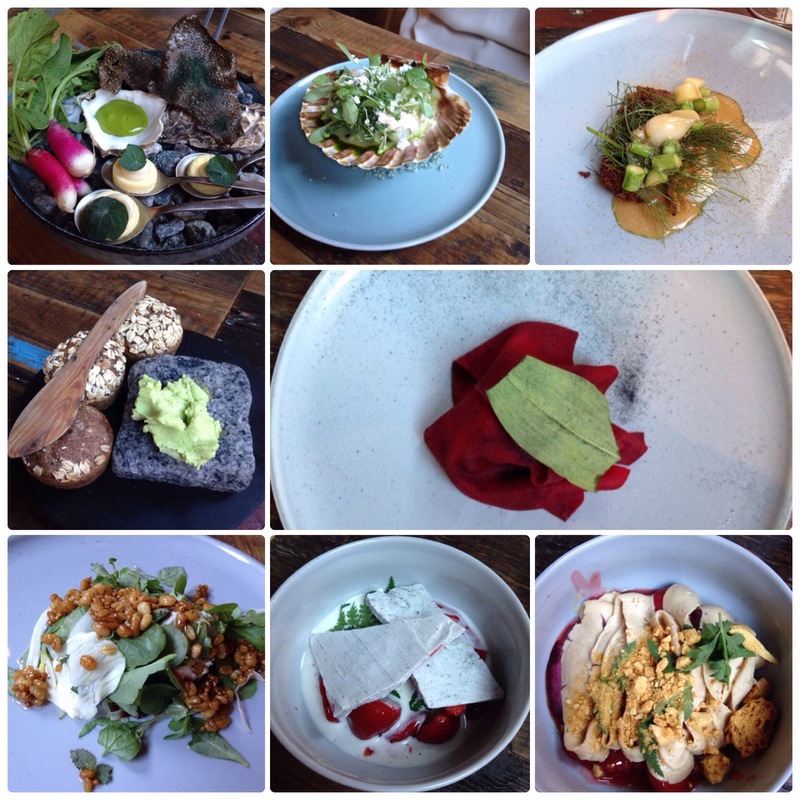 I checked it out and loved the decor of the place, and decided if I ever went to Copenhagen I just had to try this place out. And thats exactly what we did. The three of us decided on their three course meal, which turned out to be a six course meal. We had some wine and mineral water. The food in the three course meal was different depending on which menu you chose, but the added extras was the same regardless. One of us had the regular Høst menu, with the wine package and two of us had the Høst signature menu but no wine package, just single glasses of wine and beer. And I’m telling you.. it was worth it. After the restaurant, we biked back home and ended up, just like on Friday, on the balcony planning Sundays excursions. Walking and biking are great ways to see the sites. And biking, as you note, is easier on the feet. Glad you capped off the day with a good meal. What beautiful scenery! And those food looks so interesting! The food really did look gourmet! You have a blog, so food shots are permissible!! Good idea! That’s what I’ll do there if I’m next in adult company. I enjoyed this. Thank you. My maternal great-grandfather was from Copenhagen and I feel a connection, however thin and fragile. I’m sure it is a different world than it was over 100 years ago but the geographical location still has the’pull’! You lived in Copenhagen? How cool is that 🙂 It seems like it would be a nice town to live in, it is definitely a great place to visit 🙂 I like your blog (what I’ve seen so far), I’ll definitely be checking it out some more.